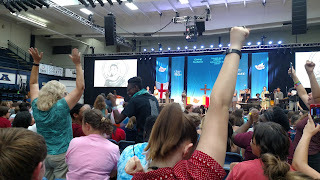 I had heard that before, that the Episcopal Youth Event was the best thing The Episcopal Church does but I am not sure I really believed it. Why would we save the best thing for our youth and not let everyone else be a part of it? Why would we only do it three years if it was so amazing. But then I had the privilege of chaperoning a group from The Episcopal Church in South Carolina this past week. What I learned is that we don't save the best thing for our youth, they create it and we, the adults, only let them have it every three years. - EYE is awesome because of the youth. They plan it, they bring their unique energy and loving spirit, they are their best selves in this place, and they speak up and speak out in this comfortable space. - The adults keep their mouths shut as much as possible (this may have been hard for me). 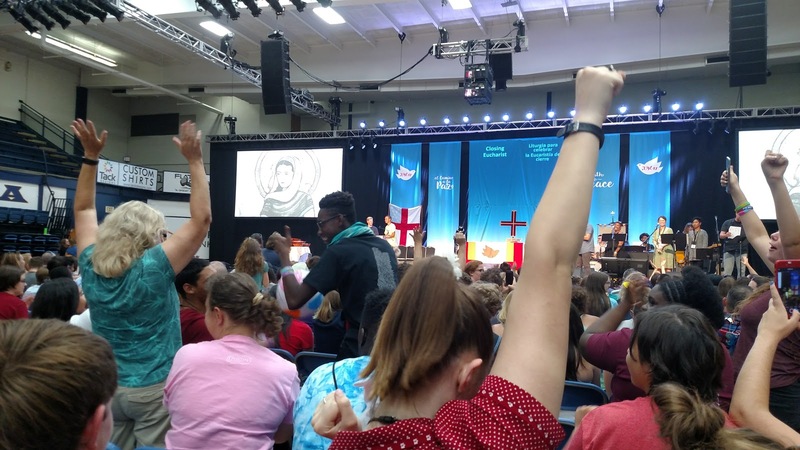 The adults who work with youth in The Episcopal Church have trained them to be leaders. And in doing so, they can be there to support them without speaking for them. I loved being in praxis sessions where no adult would ask a question or volunteer to be part of the activity so the youth could have their space. - I loved having people from such diverse geographic areas and backgrounds. My youth loved worshiping in Spanish and meeting people from all over. We collected buttons and bracelets, necklaces and Tabasco bottles, and clothespins from Western New York that would appear on our bags spreading love. Diversity was celebrated in all of its many forms. Cheering for the Lent Madness play-in winner! - The youth want to change the world. I already had one of mine email me about getting a speaker about refugee ministry to come to her school this fall. They were inspired by the stories of Kids4Peace and New Hope Oklahoma and want to know how we can start groups like that in our diocese. - Youth are resilient. We had church services that were 2 1/2 hours long and they loved every moment of it. We took them on bus trips for hours having them get on and off to see museums and they wish they had had more time. We exposed them to some really difficult things and they responded with gratitude and love. Whether it was the heat, long lines, or flight delays, I never heard a single complaint from the youth. Put adults in the same situation and the snark factor and whining would have been through the roof. - We, the adults, need to support initiatives like EYE that empower our young people. These are the kids that will be the next generation of clergy and General Convention deputies and vestry members (some of them already are the last two). 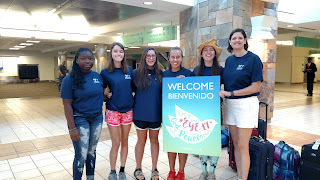 The ones that realized they wouldn't be able to come back in 3 years were excited to hear about the Official Youth Presence, young adult programs, Episcopal colleges, and other ways that they will be able to connect with Episcopalians as they grow older. This has to be the beginning, not the end. I am so glad that I got to experience EYE as an adult and a little sad that I didn't as a youth. I will pack up my stuff in another year to go to General Convention and it will be great. I will love seeing lots of friends and making a difference in our church as we make decisions for our future but it won't be able to capture the spirit that was in a fieldhouse in Oklahoma last week. Watch a video from our trip! Very nice post. Youth is the force which is going to drive our future & they should be given the chance to give voice to their mind. I hope there are more programs like EYE as the world needs them.